Equity euphoria hits China: There are growing signs of speculative fervor in China. In recent years, people in China -- who tend to save significantly more than their Western counterparts -- sunk their excess savings into the real estate market. Now that the bubble in housing is deflating, they are latching onto the skyrocketing stock market. Investors opened 4.8 million new stock trading accounts in March and then another million more in early April, according to the Financial Times. "There's no question there's a lot of domestic euphoria about equities within China," said Albert Brenner, director of asset allocation strategy at People's United Wealth Management. Several Chinese retail investors polled by CNNMoney said they trade stocks frequently -- up to several times a day -- in part to have fun. One Shanghai woman, who didn't give her full name, said she's not worried about trading expenses hurting performance because "fees tend to drop during bullish markets anyway." Non-Chinese investors are also taking notice. 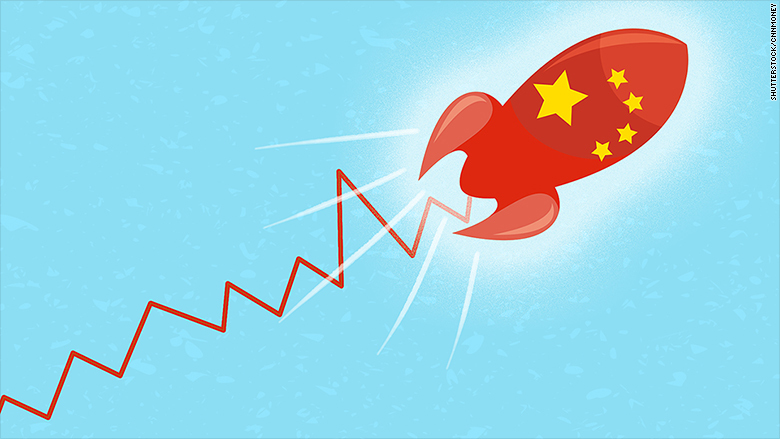 Exchange-traded funds that track China -- the best way for U.S. investors to play China -- have soared. The iShares MSCI China ETF (MCHI) and SPDR S&P China ETF (GXC) are both up over 20% so far this year. Related: China's stock market finally opens up to foreigners. Now what? Liquidity-fueled bubble? Hoping to avoid a so-called "hard landing," China's central bank is pumping liquidity into the market by cutting rates. That's good for risky assets like stocks, but liquidity-driven moves are susceptible to bubbles. Liquidity is also being pumped by the Hong-Kong Shanghai Stock Connect Program, which allows investors to buy Shanghai stocks through Hong Kong -- and vice versa. Not only is fresh foreign capital flowing onto Mainland China for the first time, but excess liquidity inside China is flooding into Hong Kong. Goldman Sachs isn't worried: Of course, not everyone believes it's time to call China's rapid rise a bubble. Timothy Moe, co-head of macro research in Asia at Goldman Sachs, told CNBC the market "certainly is getting frothy" amid "very frenetic retail activity." "Is that a bubble that will crash the system? The answer is not yet," Moe said. In other words, just because Chinese stocks look very speculative doesn't mean the party has to end today. One possibility, Patel said, is for the bubble to end "benignly" if China's growth regains momentum, justifying current valuations. He said that looks unlikely and there's a better chance the opposite will occur. Another possible outcome is the stock market keeps roaring ahead before imploding, like it did the last time. "To be clear, what's underway in China is an out-and-out bubble, but there's plenty of money to be made riding bubbles up a bit," Bespoke Investment Group wrote in a note to clients. The firm said it "may be worthwhile to consider a small position" in Chinese ETFs like the SPDR S&P China ETF (GXC). Just remember: Bubbles are notoriously difficult to time, even for sophisticated investors.